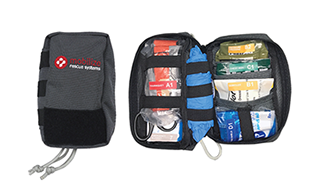 The Mobilize Rescue Systems Compact kit is small enough to carry on your person. YOUR partner suffers a nasty cut while carving the bird. An accident victim is suffering convulsions. A passerby passes out – right at your feet. Of course, one of your first thoughts is to see what you can do – usually not much – until the paramedics arrive. This has been the normal protocol in emergency situations for time immemorial, but things have changed. You, you, you and you now have the power to do more with the advent of products like the Mobilize Rescue Systems. 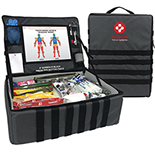 Simply put, it is an interactive first-aid kit that can arm untrained bystanders with enough medical know-how and equipment to help someone in distress until the professionals arrive on the scene. The Mobilize Rescue Systems Mobile kit. Developed by a team of emergency response educators, military veterans, physicians and software developers, Mobilize Rescue Systems launched about a year ago. It is an app-based, interactive first-aid kit that uses an algorithm to determine the most serious injury or injuries. Then, through prompts, it directs the user with step-by-step instructions on how to manage the emergency using corresponding, color-coded supplies in the first-aid kit. This latter element sets it head and shoulders above competitors. 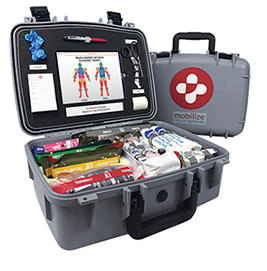 The Mobilize Rescue Systems is based on the standard emergency care guidelines and can be used in a variety of emergencies, including CPR, allergic reactions, severe bleeding, cardiac arrest and chest trauma. Among the supplies, depending on the kit: First-aid Guide, Sterile Conforming Stretch Gauze, Burn Cream Packets and Instant Glucose. The kit has been put through its paces by various safety experts and professionals and has not come up wanting. That’s a good thing, considering what’s at stake, including the pricetag. and 10-pound Mobile ($1750) that come with an embedded iPad. The one-pound Compact ($180) works with smartphones. The latter, small enough to fit comfortably in a bag or large pocket, currently has only eight supplies: SOF-T Wide Tourniquet, Emergency Trauma Dressing, QuikClot Bleeding Control Dressing, Hyfin Chest Seal, CPR Face Shields with bite block, Emergency Space Mylar Blanket, Trauma Shears and Nitrile Gloves. The larger kits have 30, including all of the aformentioned. The Mobilize Rescue Systems Comprehensive kit. A brand representative with whom I spoke at the recent Luxury Technology Show in New York, where the kits were on display, acknowledged the shortcoming and said it is being addressed. Still, with its limited supplies, the Compact kit is a handy piece of equipment to have on hand if someone falls down and breaks his or her crown. Visit http://www.mobilizerescue.com/ to learn more about the Mobilize Rescue Systems.